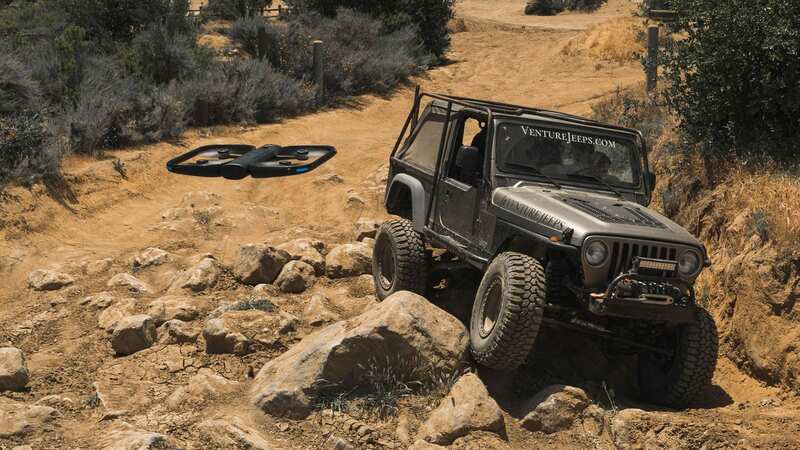 The self-flying camera drone from Skydio that first burst onto the consumer drone market in February this year now has an incredible new feature: it can now follow your car. Built for storytellers, adventurers and content creators alike, the fully autonomous flying camera has already captured the imagination of drone photography enthusiasts. Now, with the powerful computing technology of the NVIDIA Jetson, the Skydio R1 can plan movements, navigate complex environments and make intelligent decisions in real time..
13 cameras in total and five flying patterns (Follow, Lead, Side, Orbit and Tripod) have already introduced a new chapter in the story of human real-time adventure. People have already been using it to capture snow skiing, running and jumping, bike riding, and so much more – with many videos attesting to its fantastic obstacle avoidance capabilities. Now, in it’s first major firmware update, Skydio have added a feature that is bound to get engines roaring and hearts pumping. Adventurers and explorers, off-roaders and road-trippers can now use “Car Follow” using the software update available today, to capture and share footage of their travels – all captured autonomously. Adam Bry, CEO and co-founder of Skydio, says the new cinematic modes introduced in the new software update are just the start. “With Skydio R1, cinematography becomes a software-defined experience,” he said. If your interest is as piqued as ours, Skydio’s R1 is available now for athletes, adventurers, and creators alike at www.skydio.com in the USA and Canada for $2499 USD.